He is a member of ANZ Endocrine Surgeons and his goal is quality management of the thyroid and parathyroid surgical patient. High volume endocrine surgeons have been shown in studies to produce better outcomes for patients requiring thyroid and parathyroid surgery. Establishment of an endocrine surgery outpatient service at the public hospital. Acquisition of a state-of-the-art nerve monitor for Campbelltown hospital. The monitor enables safer surgery and allows complex endocrine surgical cases to be carried out. Establishing a quality 4D CT service with i-Med radiology for work-up of parathyroid patients locally. Dr. Ong’s article in Campbelltown Private Hospital’s Summer newsletter explaining indications for thyroid surgery. 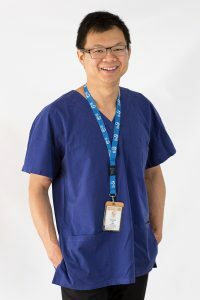 © 2019 Dr Andrew Ong FRACS. All rights reserved. Encrypted website.